The video game industry works like any other artform out there. By it authors, painters, film directors, or game designers, each are influenced by the works that came before (and sometimes from multiple genres). 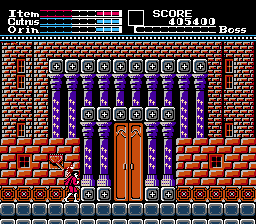 it should come as no surprise, then, that even from an early time, games would come out that were inspired the basic mechanics of Castlevania. 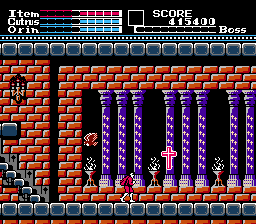 Termed "Castlevania-clones, there are surprising number of thee games litered through the history of video games. 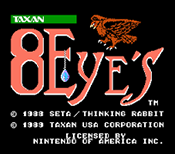 One early contender (and so far the earliest one we cover here on the Inverted Dungeon) is the NES game 8 Eyes which came out two years after the first title in the Castlevania series. At first blush the two games wouldn't seem all that similar. Set in the distant future after a nuclear war as destroyed all civilization, the Great King has managed to gather the power and the resources to rebuild the world. Using the power of eight gems called the "8 Eyes", the Great King works to restor order and rebuild the world. Sadly, his Dukes steal the gems from the King and go to eight hideouts to enjoy their power. Only the hero, Orin (along with his eagle Cutrus), can go to the eight palaces and defeat the Dukes to retrieve the gems and save the world. So instead of a tale set in the past dealing with an evil vampire, we have a game set in the future, one suffering from the apocalyse. Doesn't sound very Castlevania at all, does it? While the story doesn't seem very much like a copy of our favorite series, the gameplay is pure Castlevania through and through. Firstly, Orin looks like he showed up for a Castlevania II Simon Belmont look-alike contest and then was just given a quest for winning. Like, it's not even subtle about it -- there's every chance Orin was just a straight sprite-edit of Simon (since this came out a year after Castlevania II and no one said anything. Now, to be fair, despite his looks Orin isn't an exact clone of Simon. He doesn't have a whip, for one, instead opting for a much shorter sword (which makes the combat in the game quite a pain, really). He also has a falcon that flies around with him, aiding Orin in combat. 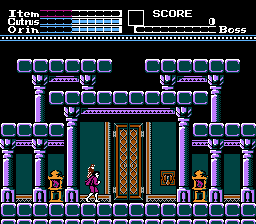 Those differences in mind, it's not hard to see the influence Simon Belmont had on Orin. Both use a primary attack as well as "sub-weapons". Orin gets the power for his sub-weapons from the souls of his slain enemies (literally crosses that float up after he kills foes), but their basic effect is still the same. Sure, some of the items functionally different, but their intent (and their influence) are clear. 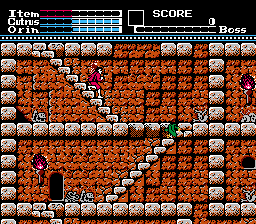 It's also not as though the post-apocalyptic setting is all that different from the standard Castlevania locales. Instead of a dilapidated, run-down gothic castle was have dilapidated, run-down neo-gothic fortresses. They're even populated with the same kinds of enemies -- skeletons, zombies, ghosts. Simon Belmont would have been right at home in these settings. Some thing have been changed in 8 Eyes presumably to try and make the game stand out from it's competition, but these changes actually have the effect of making the game harder than it needs to be -- it's already as tough as any Castlevania, but apparently the developers were feeling vindictive. For starters, defeating one of the bosses will unlock a new sword for Orin to use. 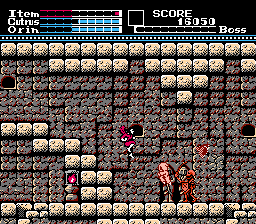 Each boss, though, is weak to only one of the various swords, so it's best to play the game in a specific order. Good luck figuring out that order, though -- clue are hidden through the game, but you'd be forgiven for never finding them. Worse still is the end-game: once Orin has the eight gems he has to take them back to the Great King's temple and place them in the altar to revive the Great King. Not so fast, though, since you have to put the gems back in exactly the right order or you'll lose the game. Again, the clues for the right order are hidden in the game, but the game is alrady brutal enough that adding a trick like this in right at the end just feels mean spirited. It's probably for these little tricks that uncessarily up the difficulty that 8 Eyes ended up as an "also ran" in the genre (certainly that's out opinion, anyway). 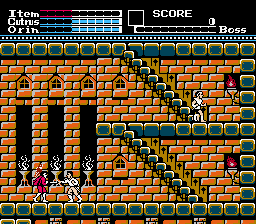 The game never recieved a sequel and, unless you're out looking for Castlevania-clones or obscure NES games, you probably wouldn't have known about it without stumbling across it on a site like the Inverted Dungeon. It is a pity, though, that 8 Eyes ended up hobbled by it's weird dificulty and hidden clues. On it's own, the game is a competent game, well constructed and very playable. If you don't mind searching every nook and cranny for the secrets needed to get a good ending, you might just have fun with it for a spell. Ceratinly, among Castlevania-clones is stands above some of the dire dreck that game companies have spit out. Just be prepared for a brutal path if you want to see the best ending the game has to offer.